Stackers and other light-duty lifts are popular, and much more economical, alternatives to heavier-duty lift equipment such as forklifts. 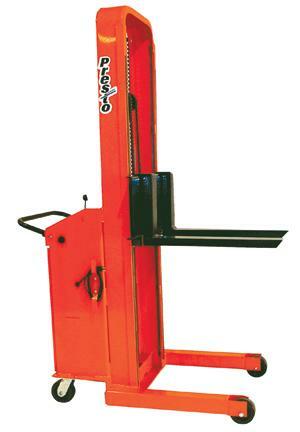 Stackers can be manual or electrically powered and have a variety of different capacities and specifications. Manual options have minimal maintenance and upkeep and electric options offer easy maneuverability and raising and lowering of materials. The S. W. Betz Company has a long history of providing material handling solutions in the form of different types of stackers to its customers. Some of the different types of stackers that we carry are listed below. Manual Stackers – Ideal for light to medium capacity use. Minimal maintenance and easy to operate. Ideal for use in various workstation and workplace applications. Lifts to maximum heights of around 80 inches. Powered Stackers – High-performance, fully-powered stackers provide maneuverability and versatility. Raised heights can go above 150 inches and are commonly found in warehouses, loading docks, light assembly work cells, retail sales floors, and others. Electric Stackers – Ideal for crowded and compact work areas. This stacker is designed to lift heavy loads on a daily basis. Both portable and stationary units are available. Battery Powered Stackers – Ideal for light to medium capacity use. Quick connect battery. Counterweight Stackers – For applications where outside straddle legs will not work. Has adjustable forks and capacities up to 1,100 pounds. Straddle Stackers – Ideal for medium duty pallet handling. Capacities up to 2,000 pounds with adjustable forks. Lift Pallet Stackers – Easier to use and more economical than conventional fork trucks, pallet stackers are ideal for servicing pallet racks. Forks are adjustable, and there are multiple capacities and raised heights to meet your needs. Work Positioners – Work positioners work like portable lift tables. Provides the stacking ability of a normal stacker while being able to transport materials to different locations. Drum Stackers – Raise, lower, and store drums in your facility. The S. W. Betz Company has dealt with many different stackers over the years for a variety of different applications. Currently, we distribute stackers for some of the most reputable manufacturers in the industry, including Presto Lifts and Vestil. Presto Lifts is located in Norton, Massachusetts and has been creating precision hydraulic equipment since their inception in 1944. If you are in need of or would like more information on any of our stackers, please contact us and one of our team members will be happy to assist you. For more information about Stackers or any other product or service from S.W. Betz, fill out and submit the form to the right.